The topic upon homeless people has always been a problem, it is a problem that is shared all around the world.I would like to talk about my own home city of Los Angeles. In the county of Los Angeles it is approximated that there are 254,000 people who are considered homeless. Where do they all go? The city of Los Angeles is one of the biggest cities and is yet to have more than one foundation that helps the homeless. Skid Row is located in Downtown, Los Angeles, a huge city full of tourists, businessmen and women, and entertainment. It is the center of attention in Los Angeles, the Staples Center is there and many other attractions that absorb money. Yet,there is not enough places to provide care for the homeless. Just around the district of Skid Row there are about 17,740 people who are in need of shelter or a home. It is extremely saddening to discover that the help provided to people is not enough at all. People wait in line for hours hoping that they have the opportunity to sleep in a bed at night. Some people refuse to even make an attempt and don’t even make the line in order to get a room because they have extremely low hopes that they will receive anything. So the location itself is not only crowded within, but immensely overcrowded on the outside; homeless people are seen for numerous blocks just making their own little homes hoping that they are fortunate enough to be first in line. It begins with not giving them enough support and the help these people need. Only providing themone place in the middle of a large city. In continuation, the government has decided that it would be best to push away the homeless people from the city. Every few months you see Downtown, Los Angeles expanding more and more, constructing new buildings that would bring more money to the city. At the same time you see buildings being built near train tracks in East Los Angeles. How long will it be until the homeless are unfortunately evacuated from the buildings they have right now and later on receive no help at all?Although these people do not have shelter, food, or a stable life. These characteristics they unfortunately do not have does not make them any less human than you and I, or the rest of the society that is super fortunate to live with a ceiling over their head. It is pretty said and done that what makes us different from the rest of the species and qualifies us as humans is the ability to have empathy. Yet us, the ones that extracted these people from their only few resources are lacking this very strong detail that makes us human. So it would be best if society would not treat them as if they were “trash” on the streets, because the ones who ignore and have a negative connotation upon these people have no right to speak. If we continue in the same path we try to ignore instead of making the attempt to help, it would be so hard to imagine the catastrophe that would occur for homeless people. The number continue to grow, according to the article, the homeless population is once again estimated to have 254,000 men, women, and children, homeless, just in Los Angeles. This must not be allowed at all. 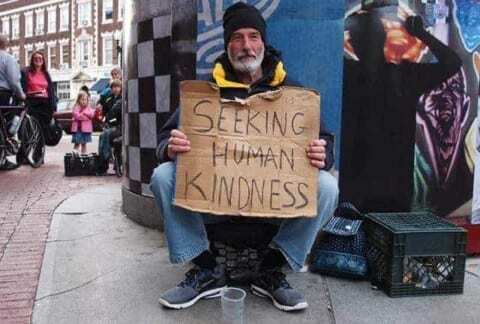 Things must be done to have a change in this society that has continued to make the same mistake of not giving the homless the support that they truly need. Letter to the President by Nixon is licensed under a Creative Commons Attribution-ShareAlike 4.0 International License. Letter To The Future PresidentWhy The Education System Needs More Funding.